Russia's crowning glory. Apart from studying Russia's prospects as an outsourcing destination for corporate manufacturing and service functions, GIM students visited Vladimir, one of Russia's oldest communities and its medieval capital. Assumption Cathedral, where princes of ancient Russia were once crowned, stands in the background. If the Kellogg School is the place where students make things happen, the Global Initiatives in Management program is surely Exhibit A. Read the related story: "Student fights AIDS crisis with Kellogg internship"
Africa, through a child's eyes. 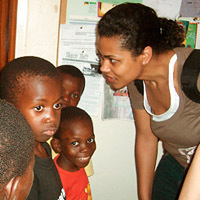 Bethany Pinnick '07, interacts with orphans at the Ebenezer Child Care Trust in Livingstone, Zambia. There, GIM students sang and danced with the children and presented a donation to the facility, which accommodates children affected by HIV/AIDS. A focus of the Kellogg visit to Southern Africa included HIV education. 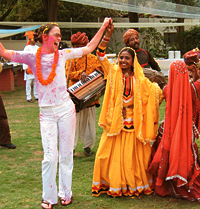 Kim Hickey '07 takes part in the celebration of Holi during the GIM India trip. Students learned about Indian cultural traditions and examined opportunities and challenges for foreign investment in the country. 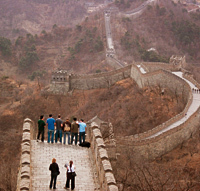 A new era for China: Atop a staircase along a portion of the Great Wall of China, GIM students experience the country's landscape. The group also studied the blogging phenomenon and the relation of emerging technology to increased profit for companies there. Now in its 17th year, GIM allows students to custom-design an academic excursion to a foreign country or region. While faculty advisers — including Professor Mark Finn, the program director — provide guidance, students handle key aspects of the course, from lining up speakers for 10 weeks of Evanston-based classes to coordinating travel arrangements for the two-week-long trip. 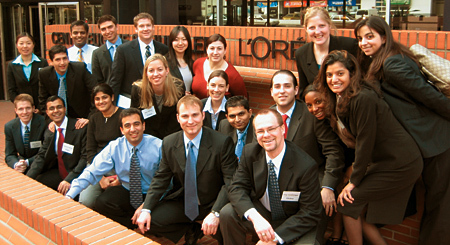 Kellogg aficionados frequently cite GIM as an example of the power students have to shape their academic experience at the school. This year, more than 300 full-time students traveled to eight countries, exploring business topics of their own choosing and building networks of contacts. Students in the Executive MBA Program and The Managers' Program also planned and conducted their own GIM trips. GIM is now as much a part of the Kellogg brand as is the school's reputation for nurturing team leaders. 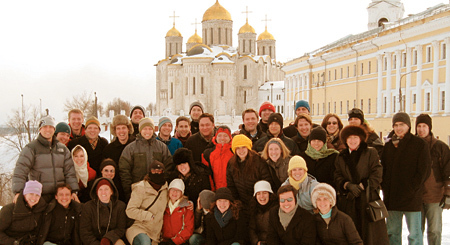 But in 1989, when Samuel "Sandy" Haviland '90 first approached Kellogg administrators with his idea for a group study trip to the Soviet Union, he wasn't sure the notion would ever get off the ground. Haviland's initial proposal — which he concedes needed more refinement — was met with reservations by the administration. "I think anyone who is easily dissuaded would have quit at that point," says Haviland, now president of Haviland & Co., a financial services firm in Connecticut. Dean Emeritus Donald P. Jacobs had his own concerns. "Sandy came into my office and said, 'The Berlin Wall has come down and there's all this happening in Eastern Europe and we want to be a part of it,'" Jacobs recalls. "He wanted a student-driven, student-organized trip. We said, 'OK, but there ought to be some faculty who go along with you.' We were also worried about the volatility in Russia at the time, and we wanted to be able to guarantee the students' safety." Undaunted, Haviland rethought the proposal. He looked to several senior faculty members for help in repackaging and selling the idea. The experience turned into an object lesson in tenacity — not to mention marketing and organization behavior. "Frankly, we had not done enough homework about how the dean's office thinks and operates," Haviland says now. "It was naïve to be stunned that they would at first say no. But the students we had talked to were too enthusiastic about the idea to quit." Haviland's first step was to gain the support of several key faculty members, including Professor Walter D. Scott, who eventually became the faculty adviser for the trip. With Scott's help, he set about creating a formal, written proposal that emphasized the academic nature of the expedition. In addition, he and student government president-elect Dennis Valdes '90 formed the core of a team to perform the legwork necessary to launch the program, removing the main administrative burden from the faculty. Finally, Haviland vowed that the group would "take the time to get it right," promising to address any concerns before repeating the experience the following year. Satisfied, Jacobs signed off on the plan, and a group of students traveled to Moscow and St. Petersburg over spring break. The trip succeeded beyond even Haviland's expectations. The group met "all the corporate people we'd set out to meet," Haviland says, as well as high-profile entrepreneurs and members of the Soviet government. In an unexpected coup, the former chairman of the U.S. Joint Chiefs of Staff, Admiral William Crowe Jr., was a passenger on the return flight home and freely shared his insights with the Kellogg group. "It was clear we'd achieved everything we'd hoped to achieve on the trip," Haviland says. Almost immediately upon their return, the group began working with the Kellogg curriculum committee to develop Haviland's idea into a fully accredited course. Sixteen years later, literally thousands of Kellogg students have experienced the same thrill of discovery that Haviland and his team enjoyed during that Muscovite spring in 1990. "The funny thing is, we started this without any grand vision," Haviland says. "Our goal was just to get a first-hand look at this really exciting part of the world. We never imagined that the idea would be built and refined over time to become the pervasive program it is today. We're certainly proud to see that it's become such an important part of the school." The GIM European Union class visits L'Oreal's Centre Eugene Schuler in Paris for presentations on the development of its active cosmetics division and the launch of a new Lancôme perfume.